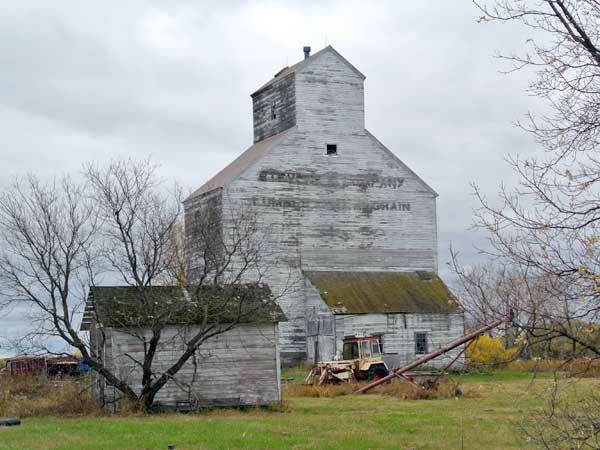 This abandoned grain elevator at Fannystelle in the Rural Municipality of Grey was operated by lumber, coal, and grain merchant Stevens and Company, owned by local resident Richard Henry Stevens. Birth registration [Richard Henry Stevens], Manitoba Vital Statistics. “Masked robbers get $1,500,” Winnipeg Free Press, 7 September 1939, page 3. Obituary [Richard H. Stevens], Winnipeg Free Press, 18 April 1978, page 49.